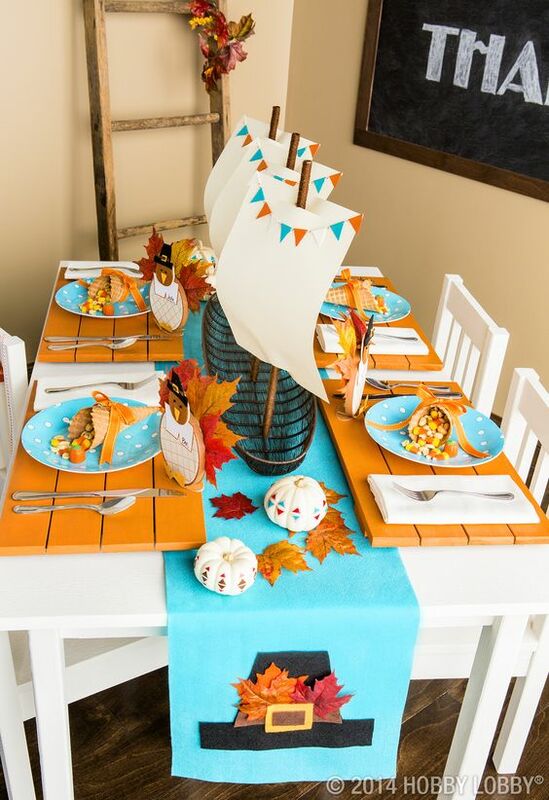 This kid’s table from Hobby Lobby is bright and colorful and many materials can be DIY! 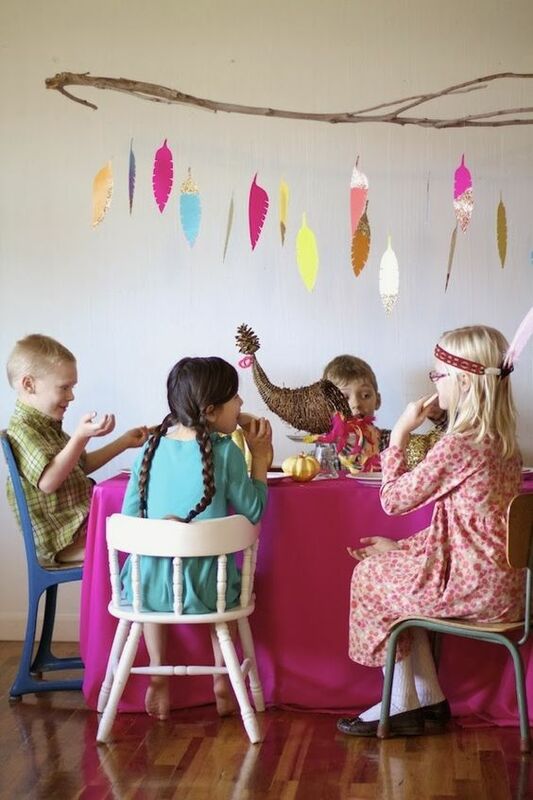 Or this fun kid’s table from Rustic Baby Chic! 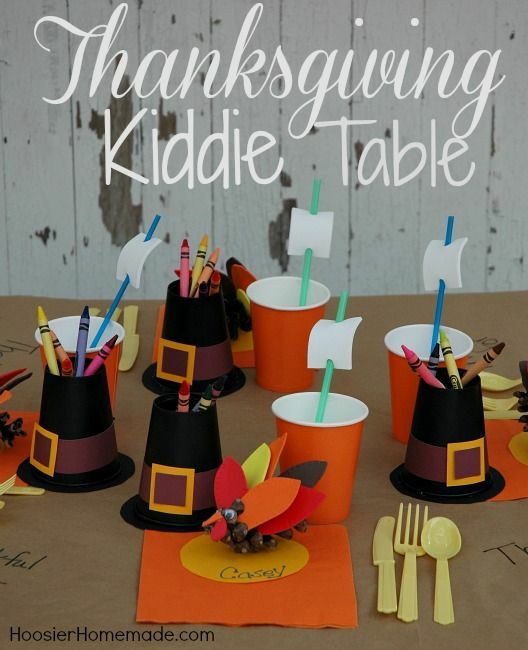 I love all the details like the crayons in mason jars that you can find at the dollar store! 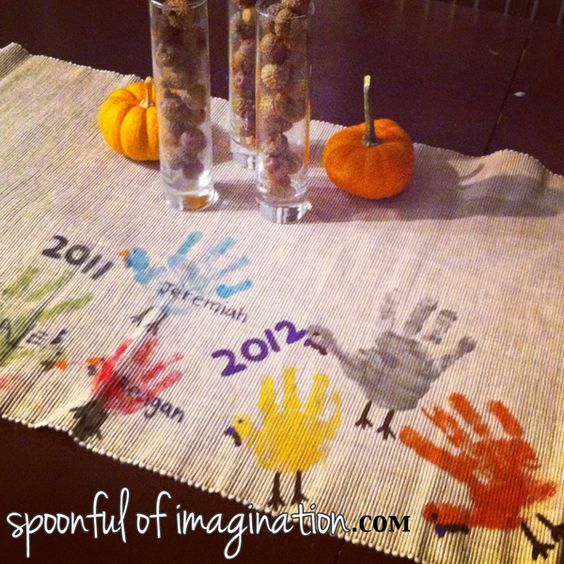 I love how Spoonful of Imagination uses a cloth table runner every year with the kid’s handprints painted on them – what an easy tradition and keepsake! 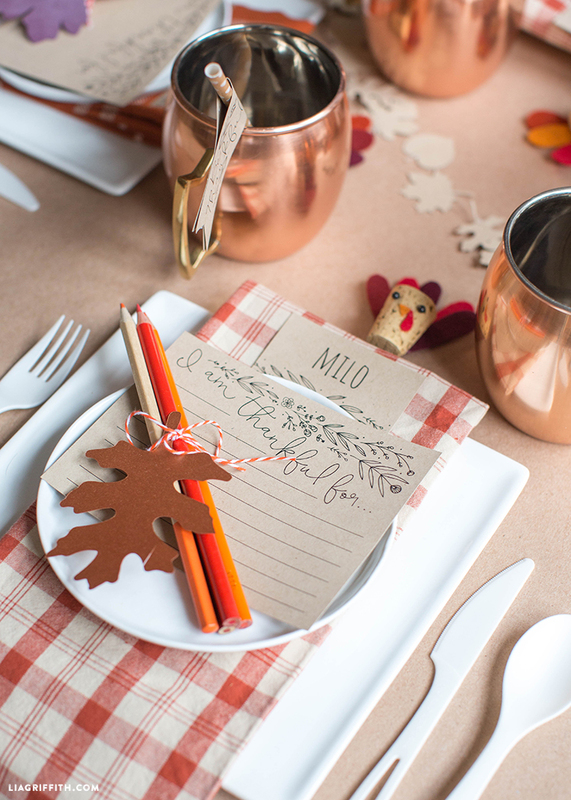 These kid’s table decorations from Lia Griffith are just adorable! 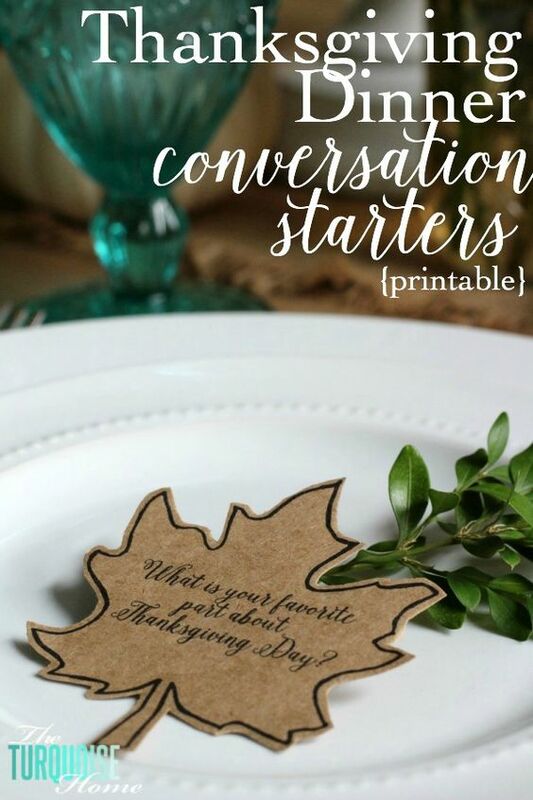 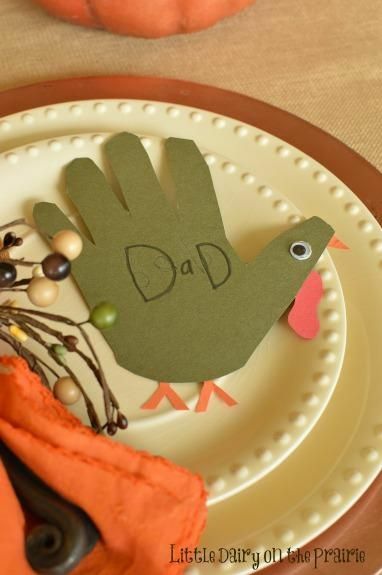 Try hand-lettering on cardstock, tie leaves around pencils or crayons and make a wine cork turkey using felt. 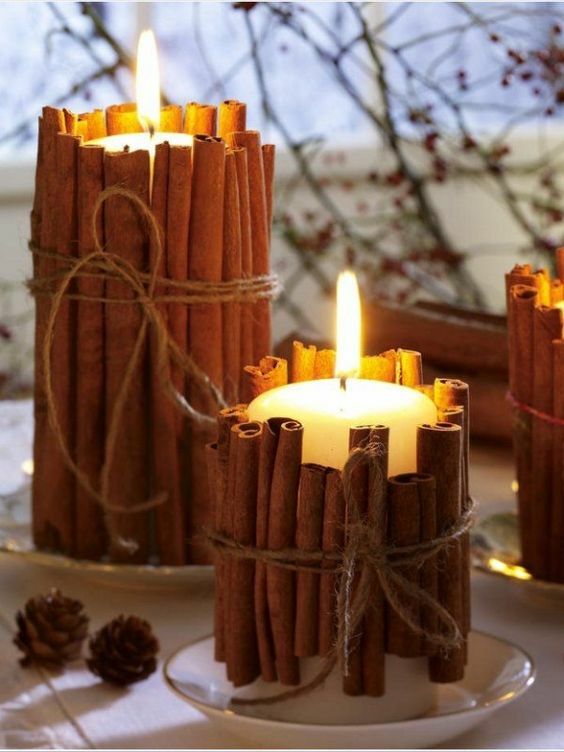 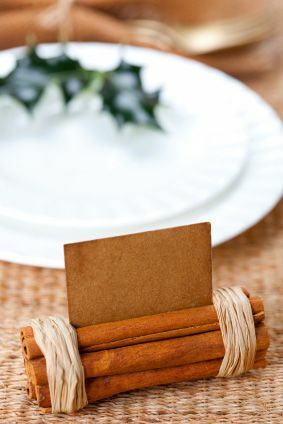 Or use cinnamon sticks wrapped around candles on dollar store plates from Just Imagine for a cute centerpiece that also smells good! 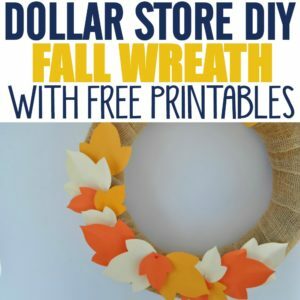 These mini succulent pumpkins from Living Locurto can be made with succulents from the dollar store and faux pumpkins. 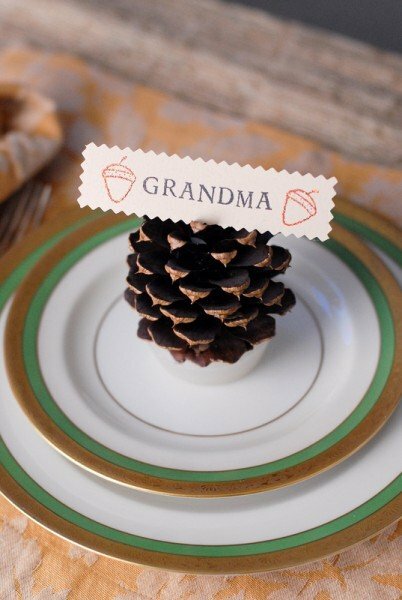 This centerpiece from May Days is simple using a vase, bowl, and candle from the dollar store and pinecones from your backyard or nearby park! 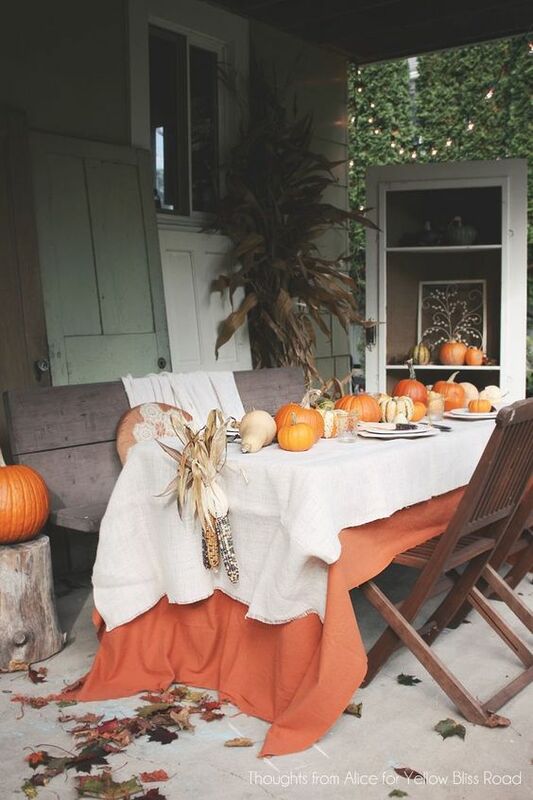 Make simple pumpkin floral centerpieces using real or faux pumpkins and florals from Fish and Bull. 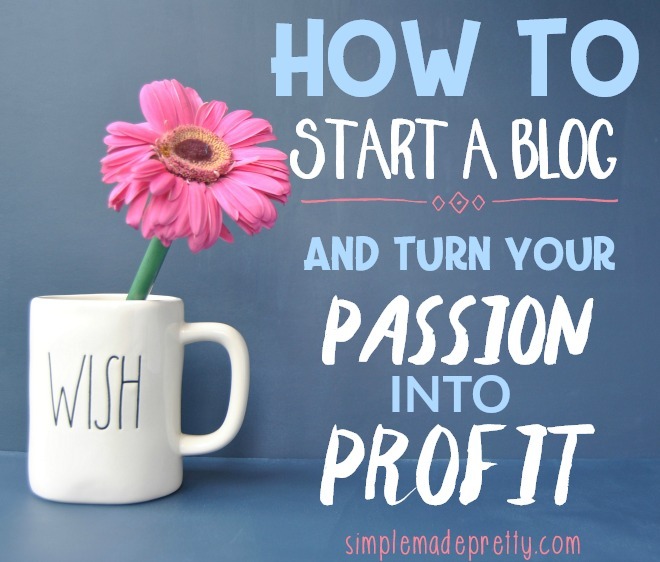 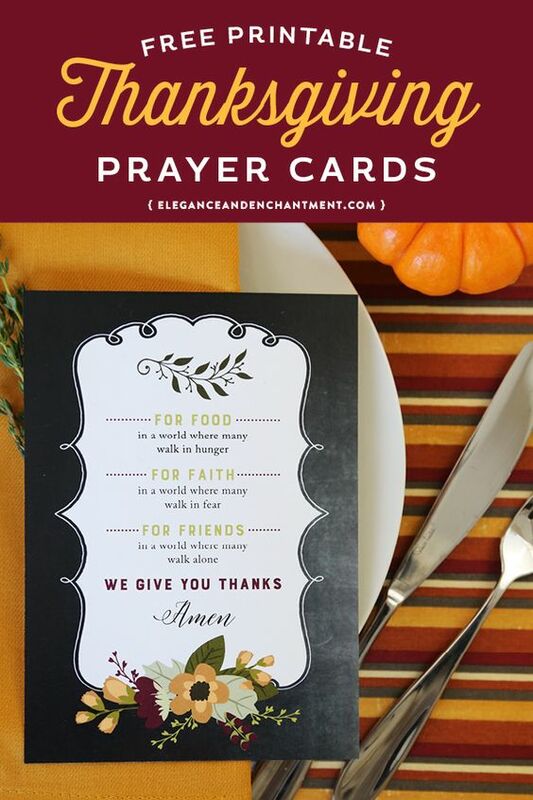 You could also put a candle in the pumpkin! 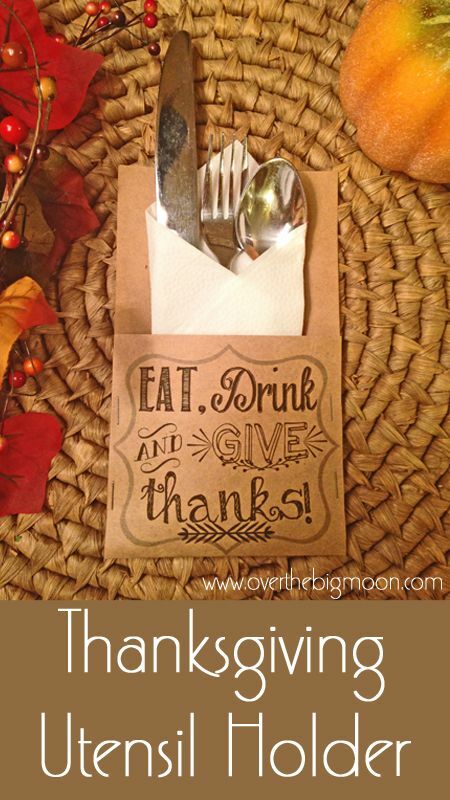 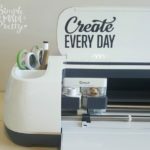 These rustic Thanksgiving utensil holders from Over the Big Moon is an easy DIY using craft paper and the free printable! 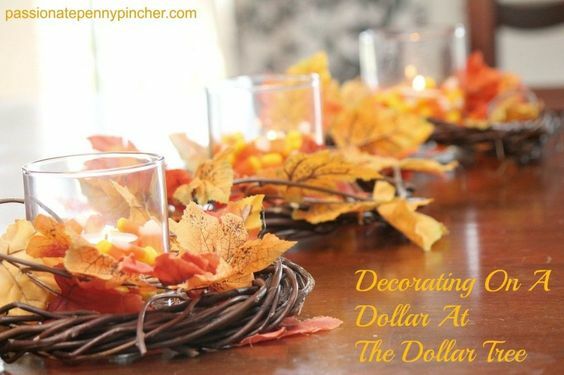 Passionate Penny Pincher used mini twig wreaths, ffaux leaves, and candles from the dollar store to create a classic tablescape. 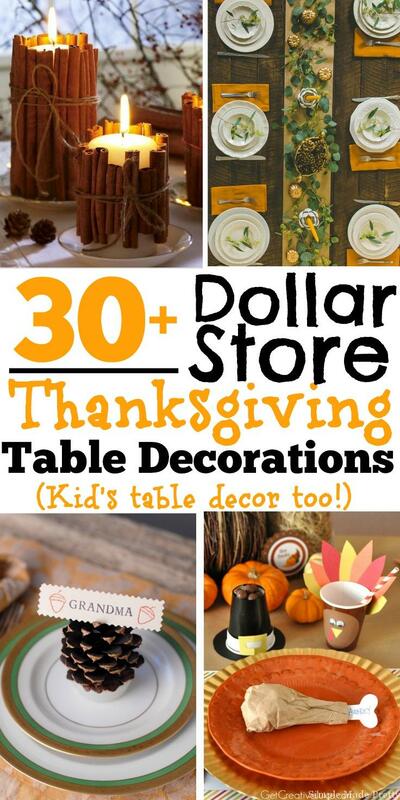 Create this dollar store tablescape from Blesser House by painting pumpkins, using pinecones from the backyard, faux leaves, using posterboard and metallic markers to make placemats, and DIY fabric napkins. 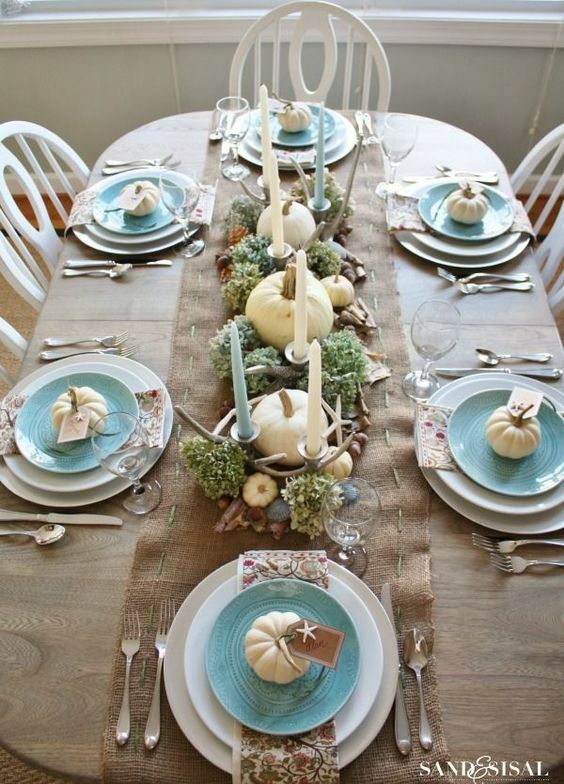 Create this coastal Thanksgiving tablescape from Sand & Sisal by adding pops of teal (plates, candles, mini starfish) with neutral colors. 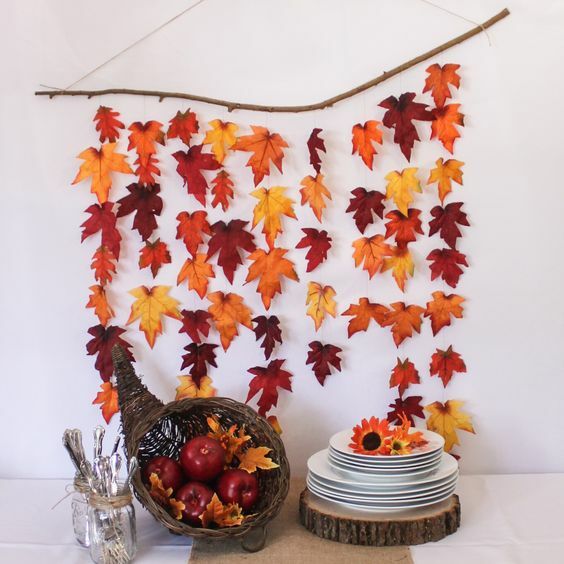 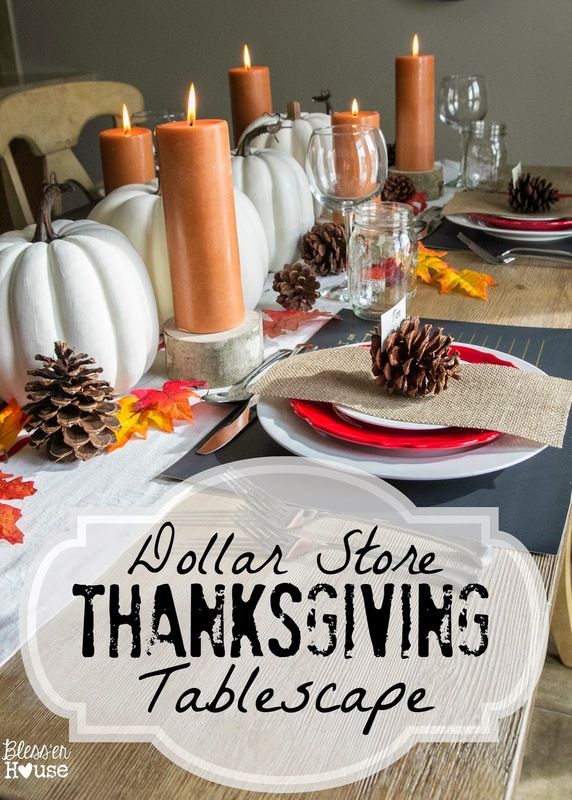 Thanksgiving is a time to be thankful for what you have so try incorporating these DIY (and Dollar Store) ideas! 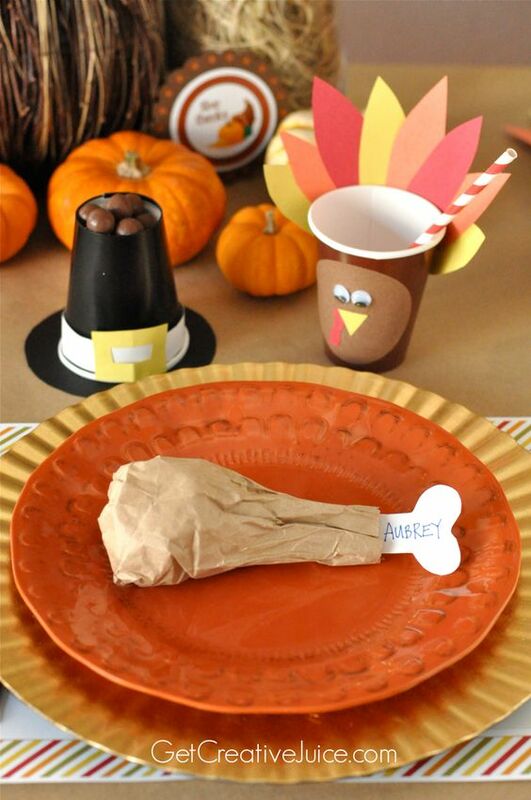 Have fun and Happy Thanksgiving!